Young Adult age-range: 14+ disclaimer on hazing rituals gone wrong. On Thin Ice is the third installment of the Juniper Falls series. This is a standalone series, meaning the books can be read out of series order with no confusion felt by the reader. I'm a big fan of Julie Cross's writing style and the way she creates young adult who are believable and lifelike, their quirkiness a breath of fresh air rather than over-done or OTT. At the same time, Cross always manages to have me clicking the pages at a rapid rate, needing to know what happens next. Brooke's numbness resonated with me. Her father is in prison and her mother has checked out, leaving Brooke to move in with her grandmother. But she doesn't adjust well, closing herself off instead of experiencing the chaotic emotions that would tear her apart. Brooke doesn't believe she needs anyone, but she received unlikely support and attention from the most popular boy in school, Jake. Their connection is strong and realistic. Believable. She opens up and learns to trust again. After a hazing gone wrong, Jake is thrust into Brooke's path. This is obviously a hockey romance, but it isn't pushed to the wayside like many novels do. Hockey is a supportive character in the novel, having it's own voice. I actually didn't know anything about the sport, and I learned a bunch without it coming off as textbook or too much information. The delivery was perfect, an entertaining way to teach. I highly recommend this novel, the series, and the author to fans of young adult, as Julie Cross is on my must-read list. 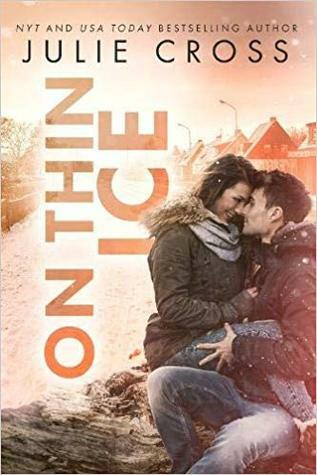 Sign into Goodreads to see if any of your friends have read On Thin Ice.